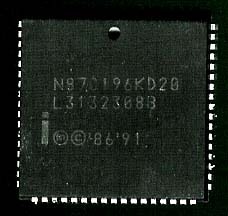 Microcontroller usually contain the programs they run on the chip themselves, or off the chip on a ROM. Intel used several naming conventions to specify wether the chip had ROM or not. and wether it was programmable. Intel created a better nameing convention. 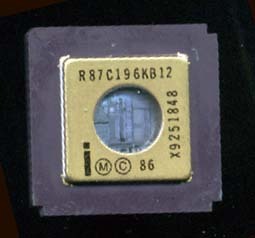 The Intel 8048 microcontroller, Intel's first µC, was used in the Magnavox Odyssey² video game console (as a 100KHz 8021) and (in its 8042 variant) in the original IBM PC keyboard. 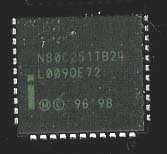 The 8048 is probably the most prominent member of Intel's MCS-48 familiy of microcontrollers. It was inspired by, and is somewhat similar to, the Fairchild F8 microprocessor. The MCS-48 has over 90 instructions with 90% of them being single byte. gadgets where cost-cutting is essential. MCS-41 are slave controllers commonly used for keyboard control or other simple tasks such as ADC control. tasks, 80-column printers and process control applications as examples. The UPI-41 has over 90 instructions with 70% of them being single byte. The MCS-51 Family includes 2 timers and 4 ports as well as 128bytes or more of on board RAM. The 51 is one of the most popular MCUs on the market. It is now being made in speeds of up to 100MHz by SiLabs, while Intel continues to make them up to 33MHz. The standard MCS-51 instruction set has 111 instructions with 64 of them executing in a single cycle. They can support up to 64k of external prgram, and 54k of external memory space. All told there areover 1000 versions of the 8051 core. The Intel 8xC251TB/TQ and 8xC251SA/SB/SP/SQ are based on the new high performance MCS® 251 micro-controller architecture. Being members of the MCS 251 microcontroller family, the 8xC251TB/TQ and 8xC251SA/SB/SP/SQ have the same advanced register based CPU architecture and a pipelined instruction execution unit. They use the powerful MCS 251 microcontroller instruction set, with many enhanced 8, 16 and 32-bit instructions available. The new microcontrollers are also specially designed to execute C code efficiently. Most importantly, the 8xC251TB/TQ and 8xC251SA/SB/SP/SQ are binary code and pin compatible with the existing MCS 51 microcontrollers. They represent the easiest way to upgrade performance of existing MCS 51 microcontroller applications, delivering up to 15 times the performance. * 8044 Includes a high-speed serial interface. Intel® MCS 96 microcontroller family of products are popular for 16-bit embedded microcontrollers. The 8XC196 products are found in a variety of embedded applications. The high-performance register to register architecture is well suited for complex real-time control applications such as hard disk drives, modems, printers, pattern recognition and motor control. Our broad portfolio of 8XC196 microcontroller products has been designed to meet your varying peripheral, memory size, addressability and performance requirements. The 8XC196 family shares a common core architecture which is register based. The MCS 96 microcontroller register architecture eliminates the accumulator bottleneck and enables fast context switching. All devices have bit, byte, word and some 32-bit operations. The table below summarizes the capture and generation of high speed signals on the HSIO and EPA. The MCS-96, like the MCS-51 is a MCU that is still being made, after 25 years of production there is still no plans to terminate it, just add more features, and get the clock even higher.